Editors note: Hey, another multi part story/mini series! Lucky for you, dear reader, is that the entire thing is already written! How cool! But wait, if the entire thing is already written, why not just post the whole thing? Three reasons; first, it’s a long piece by my standards – 1200 some words versus the 205 words of most of my posts on average. Second, I personally like to read shorter pieces…even if they’re spread out over several days. Call it a side effect of ADD. Third, like call good writing, I can leave you with a cliff hanger and have you come back the next day to continue reading. Perhaps you’ll even just add my RSS feed to your reader (see, I even made it easy for you!). Stayed tuned for a new part everyday for the rest of this week. Stories like this always start out with crazy ideas that no one thinks will happen; yet some number of hours later, you find yourself at the bar discussing the heroic adventure. Such is the case of this story: rappelling off a bridge at Exit 38. The picture at left shows where we were going to (although we ended up rapping off the other side). We chose this location because A) it was high up (and thus would be more fun according to Peter), and B) there’s a trail leading out (which is always nice). While I don’t have any official measurements, as best as we (Peter Walchenbach and myself) can figure, it’s about a 50 meter drop. We derived this number using the highly scientific method of tying one end of a known length of rope to the bridge and then tossing the rest over the side. Using a visual spectral observation method (i.e. 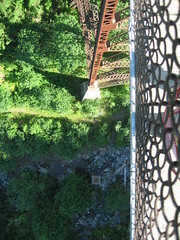 our eyes), we judged the length of rope laying on the ground down below. Like I said, highly scientific. To give an idea of how far this really was, imagine jumping from the very top of the Statue of Liberty (not including the concrete base). That’s about 3.2 seconds of free fall with a final landing speed of 31 m/s (more or less, there’s some drag not included in that calculation).